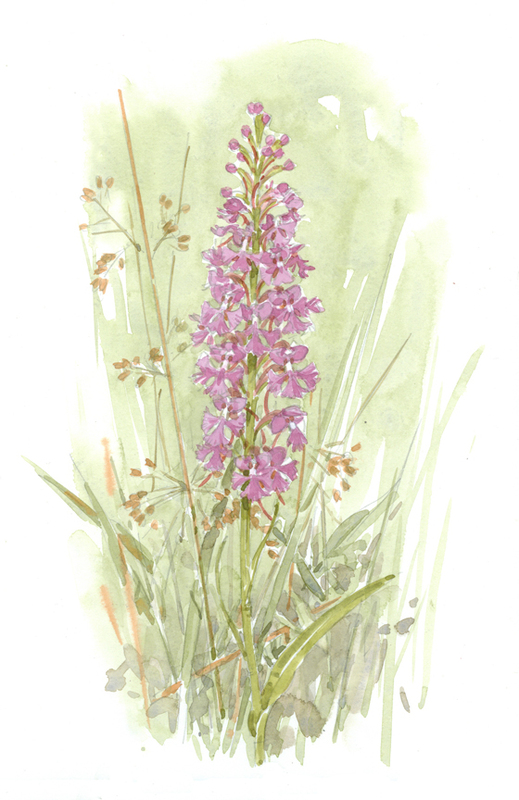 Posted on August 6, 2015 by Barry V.
I receive a tip from Ron Wolanin on Thursday that smaller purple fringed orchids are blooming at West Mountain Wildlife Sanctuary in Plainfield. Ron travels to many of the unstaffed central Massachusetts sanctuaries on a weekly basis, and his insider knowledge has been invaluable for my project. I leave Princeton early on the following Sunday, arriving at West Mountain by 8:15 am – already a warm and very humid day. I have no trouble locating the spot Ron has directed me to. Ron had warned me that the meadow was wet, so I’ve brought along an inexpensive pair of rubber wellies. The orchids are SPECTACULAR! I note about two dozen plants in various stages of blooming. The small, delicate blossoms take close scrutiny to understand their form and structure, and I get to work with my sketchbook. The flower cluster is a true spike (not a raceme), with blossoms attached directly to the straight, trunk-like stem. 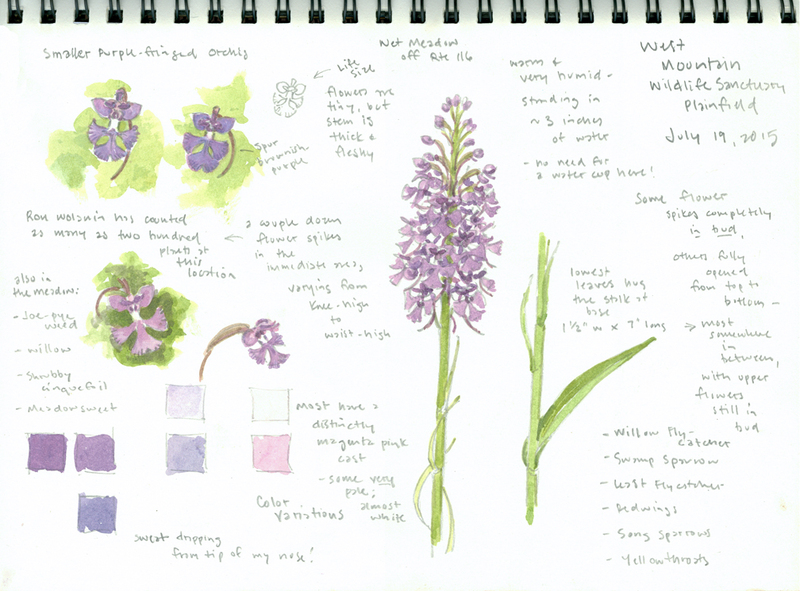 The colors of the blossoms vary from a pale pink to a deep magenta purple, and I record these variations with color swatches in my sketchbook. I want to record these colors accurately (since they are often distorted in photos) and at the same time, figure out which pigments in my watercolor box will best match the blossoms. I’m standing (or rather squatting) ankle deep in water, and have propped my pack chair in a nearby woody shrub to keep paper and materials dry. A water cup seems beside-the-point, and I simply dip my brush in the water at my feet. After painting for a while in this squatting position, I feel my left boot starting to leak and by the time I finish, my foot and sock are soaking wet. NOTE TO SELF: buy a better pair of wellies and bring extra socks next time! Swamp sparrows are sounding off all around me, and tee-ing up occasionally on low snags. 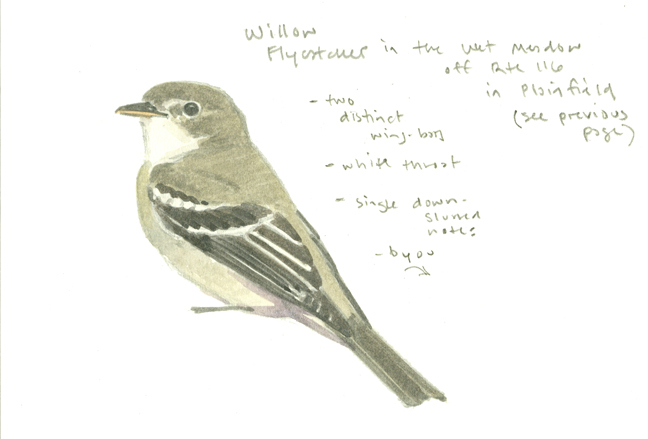 At one point a willow flycatcher moves through, giving me fine, eye-level views, and I take some notes and make a quick sketch of it. 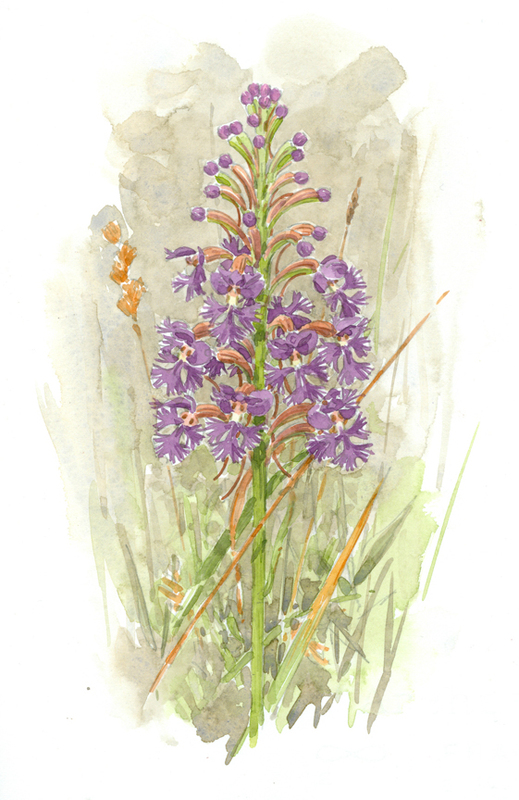 This entry was posted in Artists, Barry Van Dusen Residency, Education, News and tagged Artist, Barry Van Dusen, beautiful, bog, Museum of American Bird Art, native flowering plants, Orchids, orchis, Smaller Purple-fringed Orchis, swamp, swamp sparrow, Watercolors, west mountain wildlife sanctuary, Wildlife Sanctuary, will flycatcher on August 6, 2015 by Barry V..